I've referenced Steven Stark’s book many times in the last couple of years, so to add too many more words would be superfluous. 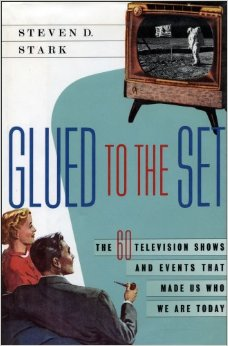 Nonetheless, there are, I think, a few more things than can be added when writing about this terrific book, and why anyone interested in classic television and American culture should read it. Rather than writing a conventional history of television and its cultural influence, Stark has chosen to view that relationship by looking at 60 television shows and/or events that reflect particularly significant points regarding the influence TV has had on us. These range all the way from the pioneers of television (The Milton Berle Show, Howdy Doody) to moments frozen in time (the JFK assassination, the moon landing, Watergate) to shows of the more recent past (Saturday Night Live, ER, Oprah). In a chapter on “Masterpiece Theatre and the Failure of PBS,” Stark again makes the reader think counter-intuitively; the massive success of Masterpiece, arguably PBS’ signature program (along with Sesame Street) is actually an indicator of the network’s failure to develop original programming, and indeed a reflection of the deep confusion surround what public broadcasting’s mission is supposed to be. This all changes with the premiere of Dragnet in 1952, as the police detective – often portrayed as world-weary, underpaid and overworked, and often stymied by the bureaucracy in his attempts to enforce the law – becomes television’s new protagonist, a status that with few exceptions remains to this day. Consequently, in an age that doesn’t seem to particularly value the rugged individualism of the frontier cowboy, law-and-order reigns supreme. Stark also makes a subtle point about the trustworthiness of television news which I think bears mention; as he praises Walter Cronkite’s career, he parenthetically notes that Cronkite’s success in casting a light on the dark shadows of the government’s often nefarious activities (for which he became known as “America’s most trusted man”) caused the public to become more cynical about institutions in general –including, eventually, television news. In the same way that society has drifted away from valuing individualism and independence, those who set themselves up as gatekeepers of the establishment are often looked upon with as much suspicion as those whom they investigate. Hoisted on their own petards, so to speak. I hope I’ve not made this sound too academic, because it isn’t. Stark writes with a clear, entertaining prose, often making his points as if he were sitting with you on the living room couch, watching the same programs. His viewpoint is that of someone who watches and appreciates television, rather than that of an intellectual or professional critic. I didn’t agree with all of Stark’s choices for the 60 most influential, and I’m not always on board with his interpretations, but I had great fun reading this book and pondering it afterwards. I’ve referred to it often on the blog, and suspect I’ll continue to do so. And if I’ve encouraged you to check it out, then I’ve done my job.